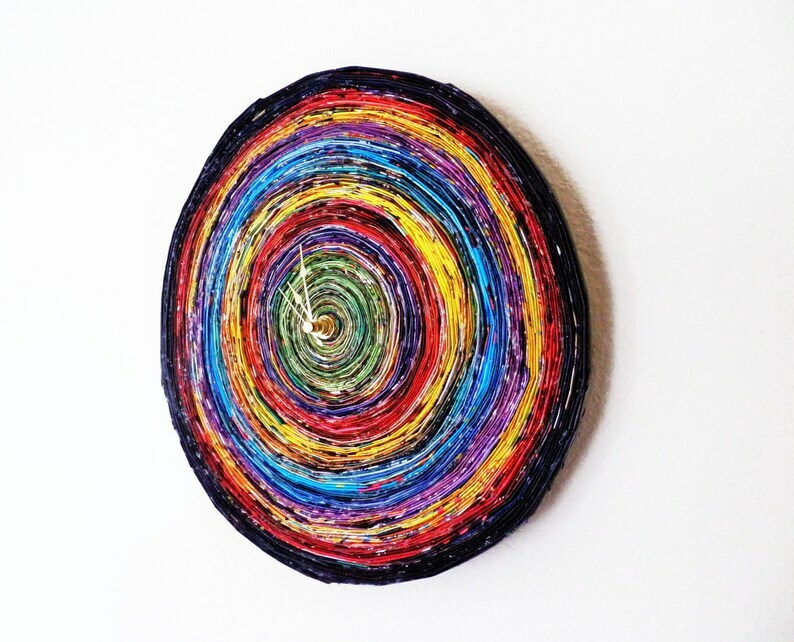 Brighten your walls with this unique paper wall clock from Shannybeebo. This colorful eco friendly piece will start some conversations and turn some heads. Each paper clock is handmade to order, so no two are exactly alike. Each piece of paper is hand picked to create the beautiful piece of eco home decor. This is a Shannybeebo original design and can be customized to fit your space. I listed several photos of this clock to show different colors & hand options. Clock size shown is 10" in diameter. Equipped with a metal hanger for hanging. The entire clock is sealed with a high gloss, non-toxic sealant. My creations are never quite the same, therefore colors will differ. Please feel free to contact me to discuss different color options. Thanks for stopping by to check out this eco friendly wall clock.